Late Chief Moshood Abiola and Babagana Kingibe will on Tuesday be honoured with GCFR and GCON national awards respectively. The event will hold at the Conference Hall, State House, Aso Rock Villa, Abuja at 10.00 am. 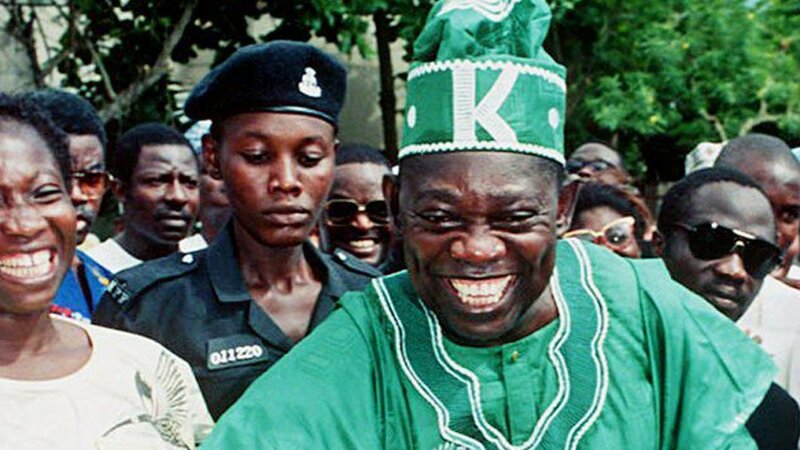 MKO Abiola is widely believed to have won the June 12, 1993 presidential poll. The election was annulled by the government of former military ruler, Ibrahim Babamosi Babangida, IBB. The cancellation led to nationwide protests which led to death, injury and incarceration of hundreds of Nigerians. One year later, MKO Abiola, after waiting endlessly for the announcement of his victory, declared himself president and was arrested. With their new titles of GCFR, GCON, Abiola and Kingibe are expected to enjoy the full constitutional provisions made for Presidents and former Vice Presidents. However, the current privileges were designed for the number one and two citizens from 1999. Giving an insight, a legal practitioner, Barrister John George Itodo, explained that there will have to be an amendment before Abiola and Kingibe can enjoy current benefits. “As it stands, they would have been in office from 1993 to 1997. Thus, what they might get would be provisions made for presidents and vice democratically elected before 1999. “But if it is the wish of the current government to see that they enjoy the benefits from 1999, it would have to initiate amendment of that section of the constitution. “Therefore, we would have a process where the National Assembly will be involved”, he told DAILY POST on Monday. 2. Allowances to members of families of deceased former Presidents and Heads of State, etc. (b) deceased former Vice-Presidents shall be entitled to the payment of the sum of N 750,000 per annum payable in the sum of N 187, 500 per quarter. (2) The allowances shall be applied for the up-keep of the spouse and education of the children of deceased former Heads of State and deceased former Vice-Presidents up to the university level. (3) For the avoidance of doubt, the spouse of a deceased former Head of State or deceased former Vice-President shall not be entitled to the allowance if she re-marries. The remuneration of all former Heads of State and Vice-Presidents shall be subject to review whenever there is an increase in the salary of the serving President and Vice-President. The Federal Government of Nigeria shall in its annual budget make provision for the remuneration of former Heads of State and former Vice-Presidents. 1. (1) An officer not below the rank of a Chief Administrative Officer. (2) A Personal Secretary not below Grade Level 12, who shall be selected by the former Presidents and Heads of State, and paid by the Federal Government. 2. (1) Three to four armed policemen. (2) One State Security Service Officer not below Grade Level 10 as an Aide de Camp to be attached for life and paid by the State Security Agencies. 3. (1) Three vehicles to be bought by the Federal Government and liable to be replaced every four years. (2) The drivers shall be selected by the Head of State, and paid by the Federal Government. 4. (1) Diplomatic passport for life. (2) Entitled to protocol within and outside Nigeria. (3) All former Heads of State and their spouses shall take the third position after the serving President and the serving Vice-President at all public functions in order of precedence. (2) Treatment abroad for former Heads of State and their immediate family where necessary at Federal Government expense. (3) Thirty days annual vacation within and outside Nigeria at Federal Government expense. 6. A well furnished and equipped office in any location of the choice of the former President or Head of State in Nigeria. 7. A well furnished five-bedroom house to be provided in any location of the choice of the former Head of State in Nigeria. 8. All former Heads of State shall be entitled to send non-political mails within and outside Nigeria as franked mail marked “POSTAGE PAID”. 9. One direct telephone line provided at Federal Government expense. (2) A Personal Secretary not below Grade Level 10, who shall be selected by the former Vice-President and paid by the Federal Government. 2. (1) Two to three armed policemen. (2) One State Security Service Officer not below Grade Level 8 as an Aide de Camp to be attached for life and paid by the State Security Agencies. 3. (1) Two vehicles to be bought by the Federal Government and liable to be replaced every four years. 5. (1) Free medical treatment for former Vice-Presidents and their immediate family within Nigeria. necessary at Federal Government expense. 6. A modestly well-furnished and equipped office in any location of the choice of the former Vice-President in Nigeria. 7. A well furnished three-bedroom house to be provided in any location of the choice of the former Vice-President in Nigeria. 8. All former Vice-Presidents shall be entitled to send non-political mails within and outside Nigeria as franked mail marked “POSTAGE PAID”. 9. One direct telephone line at Federal Government expense. According to the 2007 Remuneration Act for political officeholders, the president is entitled to an annual basic salary of N3,514,705, while the vice president earns N3,031,572.50. Since the two officers are not entitled to monetisation of most of their allowances, they are only entitled to 50 per cent of their basic salary as hardship allowance, 10 per cent leave allowance, 250 per cent as constituency allowance and 300 per cent of basic as severance gratuity. Abiola: His emoluments for the four-year period of October 1, 1993 and September 31, 1997 will amount to N68,185,277 made up of: basic salary – N14,058,820; hardship allowance -N7,029,410; leave allowance – N1,405,882; constituency allowance – N35,147,050 and; severance gratuity – N10,544,115. Kingibe: He would earn N58,763,506.50 from: basic salary – N12,126,290; hardship allowance – N6,063,145; leave allowance – N1,212,629; constituency allowance – N30,315,725 and; severance gratuity – N9,094,717.